I give up. After four of them in the last 12 months, I have run out of things to say about the phenomenon that is Liam Neeson: Action Hero. Just as I’m sure that most of you are tired of reading about it. 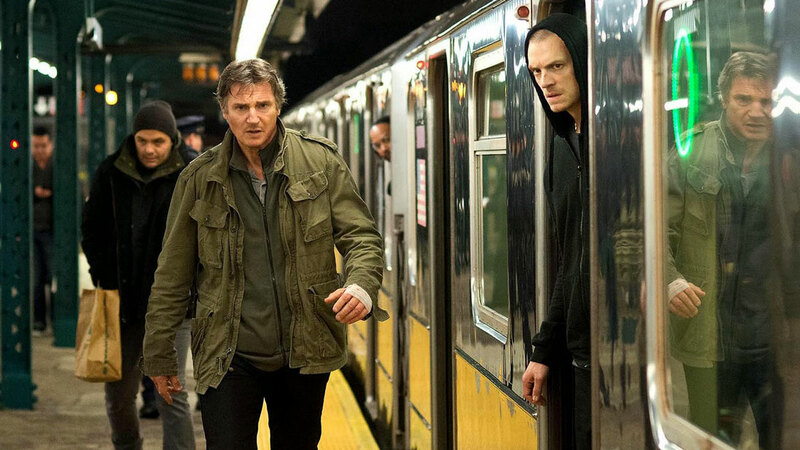 Yes, Run All Night is another action thriller starring Big Liam. This time he’s Jimmy Conlon, aging hit man in the employ of Brooklyn mobster Shawn Maguire (Ed Harris). Jimmy and Shawn have been friends since childhood and have gone through a lot of bad stuff together, including the deaths of other friends and family. Now Shawn is a more or less legit businessman, and Jimmy is merely tired, alienated from his family and marinating in booze-soaked regret. But there’s that old cliché about the sins of the fathers: Circumstances require Jimmy to kill Shawn’s hotheaded son in order to protect his own, Mike (Joel Kinnaman), a chauffeur who wants nothing to do with his father. Mike is innocent, but Shawn doesn’t care: It’s eye-for-an-eye time. Jimmy has one night to either make things right or kill Shawn. All that stands in his way is a police department that is largely in Shawn’s pocket, a small army of Shawn’s thugs, and his own son’s hatred of him. Did I mention that it’s also Christmas Eve? Ho ho ho. As directed by Jaume Collet-Serra, who gave us what I thought were two of the better LN:AH movies, Unbroken and Non-Stop, Run All Night starts well, focusing on the characters of Jimmy and Shawn as they take different approaches to their painful history. Tonally it’s opposite to the Taken films, which also are about a father trying to protect his child. (As one IMDB.com commentator noted, “Maybe he should just keep his kids in a cage.”). That the film opens with Jimmy dying in a field on Christmas day clues us in that this is not going to be a film with a happy ending, at least not in the traditional way. The perennially underutilized Vincent D’Onofrio fares better in his screen time as a veteran cop who has dogged Jimmy for years. If nothing else, Run All Night shows great taste in casting hard-bitten middle-aged actors: too bad the younger ones are so lacking in charisma that they seem to fade from the screen. In an alternate world, Viacheslav Fetisov would have fit right into Run All Night or any other movie needing a smooth Russian villain. Hockey fans, who probably once considered him a villain (in the Manichean way of sports fans), will remember him as the defenseman and captain of the Soviet Union’s national hockey team, Red Army. You don’t have to be a hockey fan (god knows I’m not) to enjoy Red Army, the documentary opening at the Amherst Theatre this Friday. It won’t hurt: In interviews with filmmaker Gabe Polsky, Fetisov gives a lot of insight into the tactics that made his team an internationally dominant force in the sport. The team was officially a part of the Soviet military, and underwent training regimens that no Western players would ever tolerate, in camps where they were confined for 11 months out of every year. They were an effective propaganda tool, held up as a result of the superiority of life in the Soviet system. After the defection of his teammate Alexander Mogilny to the west (and the Buffalo Sabres), Fetisov was instrumental not only in easing the restrictions on international play for other Red Army stars but for ensuring that they benefited from their labors—the first Russian players to join NHL teams were allowed to keep only a fraction of their salaries. Red Army is a fascinating window into Russian politics, and while it has its dramatic moments it’s just as often funny, as when we see players in the 1960s doing training exercises derived from dancers in the Bolshoi Ballet. (You remember this when Fetisov later assesses US hockey as “brutal and unelegant—no brains or style.”) Fetisov is a charming interviewee, all the more for his occasional brusqueness (he’s first scene responding to the director’s prodding by giving him the finger). One of Red Army’s executive producers is Werner Herzog, who played a memorable villain in the recent Tom Cruise movie Jack Reacher—maybe he could give Fetisov some pointers on breaking into a Hollywood career? The possibility—probably an inevitability—of science merging human intelligence with computer capabilities is a fascinating and disturbing subject. If you don’t think this is something likely to affect your lifetime, seek out the Ray Kurzweil documentary Transcendant Man (aka The Singularity is Near.) It should be an endlessly fascinating subject for filmmakers, and occasionally we get a movie as challenging and unsettling as Spike Jonze’s Her. More often, though, we get watered down sci-fi like last years Johnny Depp vehicle Transcendence. Two new movies unfortunately fall into the latter category. The most disappointing is Chappie, if only because expectations are still so high for South African filmmaker Neill Blomkamp after his debut District 9. Borrowing equally from RoboCop and its kiddie contemporary Short Circuit, this tale of a police robot that is illegally used to test out intelligence-generating software is all action and no brains. Eva is a 2011 film from Spain that The Weinstain Company has had sitting on a shelf for a few years; why it chose to just it off now isn’t clear to me. Set in a vague near-future, it stars Daniel Brühl as a genius software developer who is hired to complete a product he abandoned years ago, a child robot. This brings him back to his hometown and conflict with his brother and his wife, the woman he once loved. It’s melodramatic stuff with a needlessly grim ending in which the subject of artificial intelligence is merely a Macguffin.